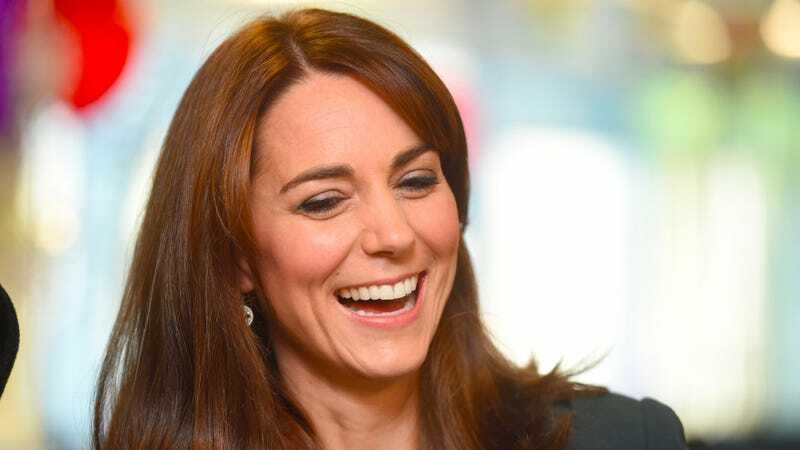 A Good Royal Rumor: Is Kate Keeping Palace Gift Shops From Selling Reproductions of Her Ring? A reproduction of Kate Middleton’s engagement ring—the sapphire that originally belonged to Princess Diana—will not be sold at palace gift shops, after all. Whatever. The real question: Is this Kate’s handiwork???? Shoppers can still pick up the matching earrings for £14.99 or the accompanying necklace for £29.99. Otherwise you’ll simply have to make do with several varieties of fine china, and/or stuffed corgis. ‘I expect the feeling at Kensington Palace is that it’s rather naff to sell cheap copies of Diana’s engagement ring. As wacky royal rumors go, I give it a B+ for entertainment value. But it’s quite clearly a stretch, if not outright conjecture, and how can we even begin to trust this information without knowing the identity of this “Palace source”? Are we dealing with a low-level functionary or perhaps a very nosy chambermaid? (Do they still have chambermaids?) Is it Prince William, rolling his eyes? Is it an animate-but-bored painting of Queen Anne? Is it Fergie? Anybody with information regarding internal palace politics, please advise.